BoyRaket.com: Win a trip to Phuket, Thailand plus P50,000 in Ever Bilena’s Big Beauty Challenge Year 3! 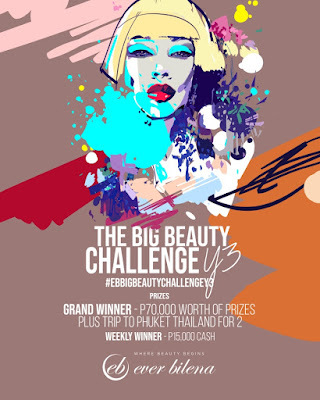 Win a trip to Phuket, Thailand plus P50,000 in Ever Bilena’s Big Beauty Challenge Year 3! Use your makeup skills to create superb and bold looks following different themesfor a chance to win the grand prize in Ever Bilena’s The Big Beauty Challenge ongoing until March 25. The top winner in the weekly make-up tutorial video contest will win a trip for two to Phuket, Thailand, plus P50,000 cashand an additional P20,000 worth of Ever Bilena products. The grand winner will also sign an exclusive contract as a brand ambassador, and shall perform special projects for Ever Open to video bloggers, aspiring and professional make-up artists residing in the Philippines, the three-year-old contest requires participants to create a one-to-three-minute make-up tutorial video on how to do a complete look following a specific theme and using only Ever Bilena products. Participants can post as many videos as they want, but using models is not allowed. The contest, which began on December 14, will test the skills of participants as they create their own versions of Ever Bilena’s weekly theme, which will be announced every Friday on Ever Bilena’s Facebook page, www.facebook.com/everbilenacosmetics. There will be one winner every week who will get P15,000 in cash. The weekly winner with the most number of video shares and likes will receive a special prize. Weekly winners will automatically compete in the grand finals. Entries must be public and uploaded on Facebook with the hashtags #EBBigBeautyChallengeY3 and #EverBilena. Contestants should tag Ever Bilena Cosmetics, Inc. A marketing representative from Ever Bilena will acknowledge the video submitted. Participants will be judged based on the following criteria: 4% creativity, 20% most number of Ever Bilena products used in the video, 20% make-up executions and skills; and 20% most number of views and shares. Ever Bilena, the leading local cosmetics brand, carries Ever Bilena Advance, a full range of make-up essentials for young professionals; Careline cosmetics for teens; Blackwater for fragrance and other personal care products.